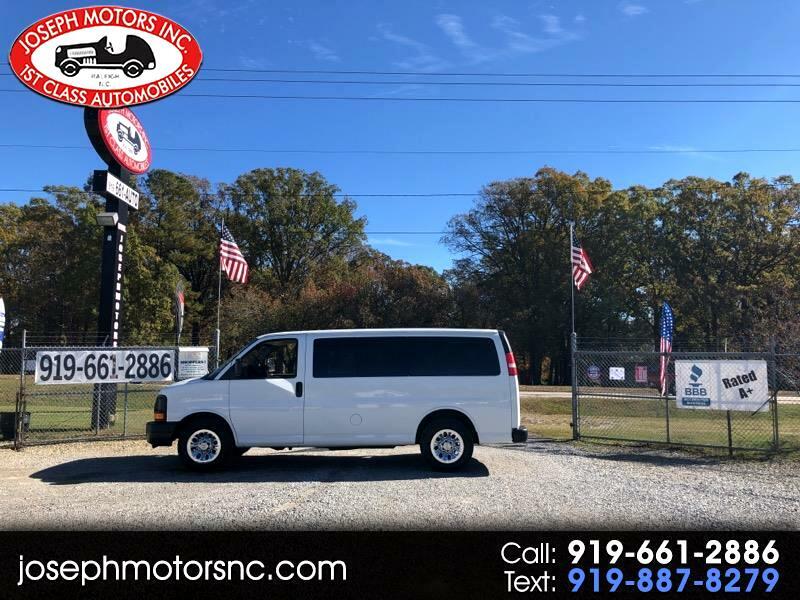 Super clean one owner Express 8 passenger van nicely equipped and priced to sell. Flex fuel Vortec 5.3 V-8 runs fine on cheap gas. Power Windows, Power door locks, Front and rear heat and AC, Cruise control, CD, Stabilitrak, side curtain and side-impact airbags for your families safety and a lot more. A very well maintained van at an affordable price that will give you years of dependable service, and it's good looking too. Just fully serviced and ready to ride. We are not your ordinary dealer; we sell only the finest pre-owned vehicles anywhere! PLEASE don't contact us with low ball offers, if you're looking for an undependable bargain that will cost thousands to repair and is guaranteed to give you years of headaches, heartaches, and downtime; THAT'S NOT US! All our vehicles go thru our strict reconditioning process and nothing is offered for sale until its perfect, PERIOD! We are very proud of our A+ Better Business Bureau rating, a rarity in our industry. Our vehicles may be priced a little higher than our competitors but once you see and drive one of ours the value is clear. If you're looking for an average vehicle we are probably not your dealer, but if you're looking for exceptional quality and outstanding service; you're reading the right add. At Joseph Motors we believe that an educated consumer is our best customer! As the saying goes '' The bitterness of poor quality remains long after the sweet taste of low price is forgotten'' This is a nice one, you'll see the difference in one that has been just slightly used, and not abused! Once you see and drive this vehicle you'll appreciate it's quality. Just Fully Serviced & ready to ride! An excellent value for an Extra- Clean vehicle., come see it in person and you'll agree that this is what a pre-owned vehicle should look like. Nationwide shipping available. Joseph Motors Inc.; The Finest pre-owned vehicles available anywhere; PERIOD. Work trucks are our specialty. We are often imitated but our quality is never duplicated! BBB accredited member Rated A+.. Come experience how simple, honest and direct a pre-owned vehicle purchase should be.. You wont be disappointed. Visit Joseph Motors Incorporated online at www.josephmotorsnc.com to see more pictures of this vehicle or call us at 919-661-2886 today to schedule your test drive. Huge selection of used commercial trucks in Raleigh, N.C. including Pickups, Vans, Utility/ Service bodies, Step vans, Stake beds, Flatbeds, Box trucks, Dump trucks, Buses and more. Since 1999. Proudly owned and operated by proud Americans. God bless America!